Larger tree sections can act as excellent simple outdoor seating. Keep a few sections that are about a foot and a half tall (about the height of your knees). Place your new seating around your firepit, throughout your landscape, or anywhere you deem fit. Tree sections are ideal because they age slowly, and can endure exposure to the elements for a few years. And once your tree-section seats are too old or too rotted out, simply use them as firewood in your firepit. Need to move your tree-section seats? Tree sections can be heavy, but there’s a simple solution to moving these seats throughout your yard. Simply push them over on their side, and roll them to their next location! This one’s a no-brainer. Use a big, beefy section of tree for chopping wood (or utilize the leftover stump itself if you opt not to have us grind it). You’ll want a wide section of wood that’s flat on both the top and bottom; something that’s sturdy and safe as you chop. There you have it. Now you can use your old tree for seating, chopping wood, or for firewood or mulch. 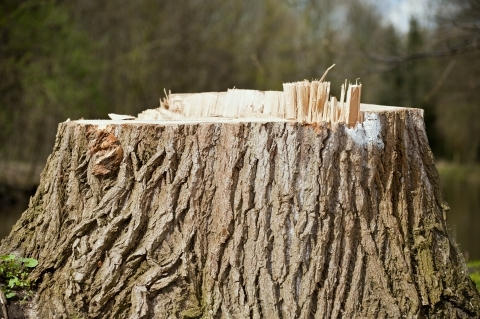 Count on JRP Services to put that dead tree in your yard to use!